Albert Einstein was a theoretical physicist, best known for his theories of special relativity and general relativity. He received the 1921 Nobel Prize in Physics for his services to Theoretical Physics, and especially for his discovery of the law of the photoelectric effect. 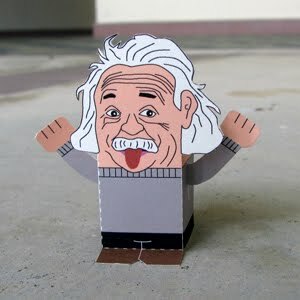 Download the PDF file here and make your own Einstein! Visit our Facebook Fan page for more goodies! Looking for kids toys online? Toysie.com.au stocks all your favourite toys, all available at the click of a mouse.